Not all guitars are pretty. Some are born of pain and sorrow, finished with failure. This is the story of Rot. 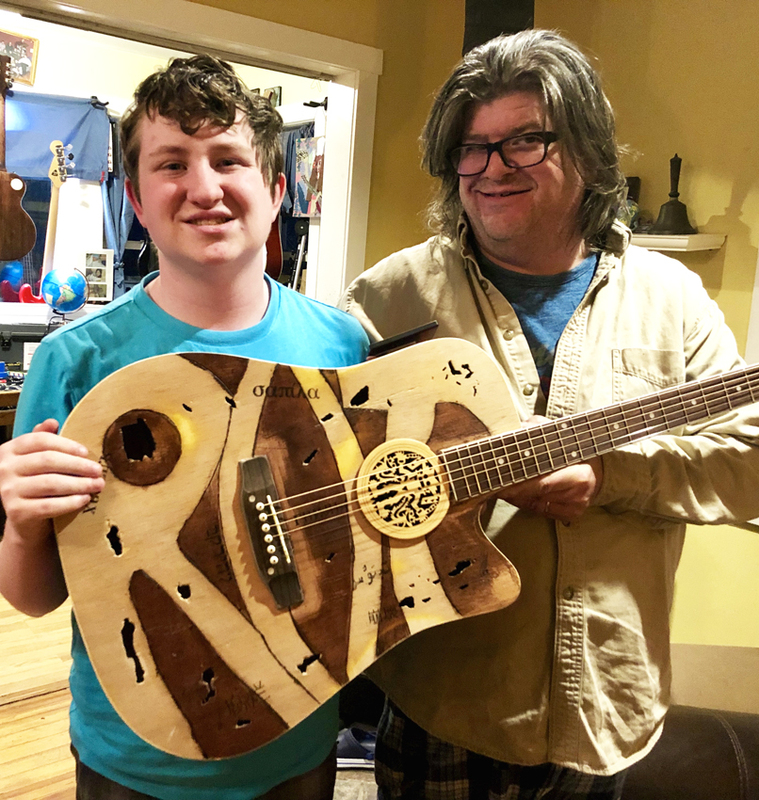 We made this guitar from pain, rage and regret! Like so many things in life, Rot started out as one thing and became another. 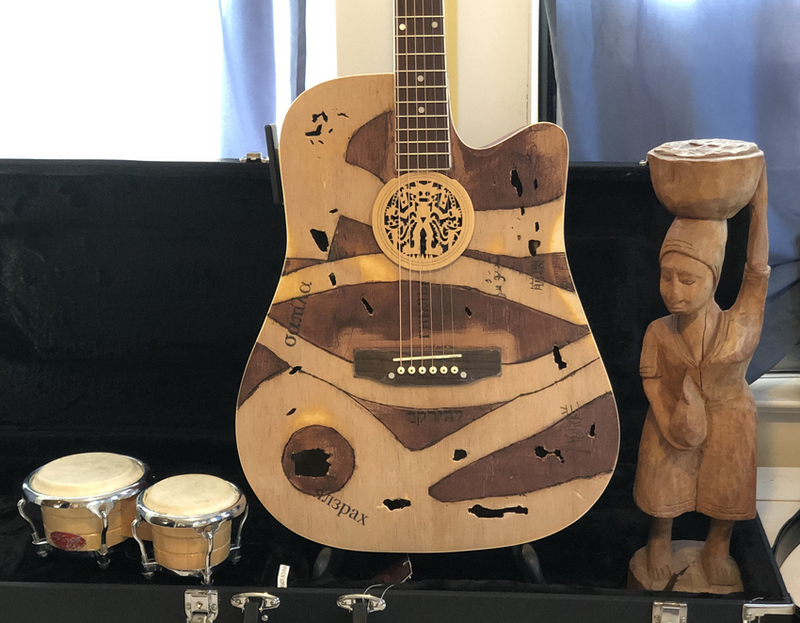 It was supposed to be an inexpensive acoustic with a corporate logo overlay. But my 17-year-old autistic son (and business partner) scrapped the logo off. I sanded the surface back and tried again, but my son ruined the second attempt too, gouging the surface deep with a pair of scissors. In the middle of the night, I awoke and caught him in the act. I reacted violently, screaming and shouting, snatching the scissors from my son’s hands, ready to stab him in the heart. Instead, I took it out on the guitar. Everything was ruined. What could I do now? How could I atone for my outburst? Some mistakes can’t be fixed. I repaired what I could and added additional damage where needed. Once you see Rot, it cannot be unseen. 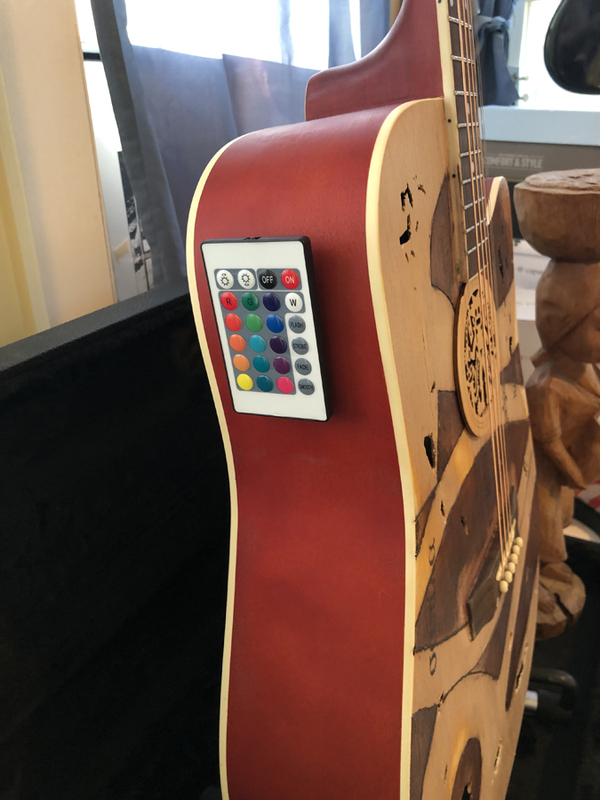 Rot’s spruce/basswood soundboard is pocked with holes and etched with a wood-burning tool — the lines are uneven because life is not symmetrical. Once you see Rot, it cannot be unseen. Certain parts of the surface failed to take the stain (like life, you will not always be accepted everywhere you want to go) and some stain bled over where it shouldn’t (because, as hard as we try, our lives can’t be compartmentalized…there’s always bleed-over). 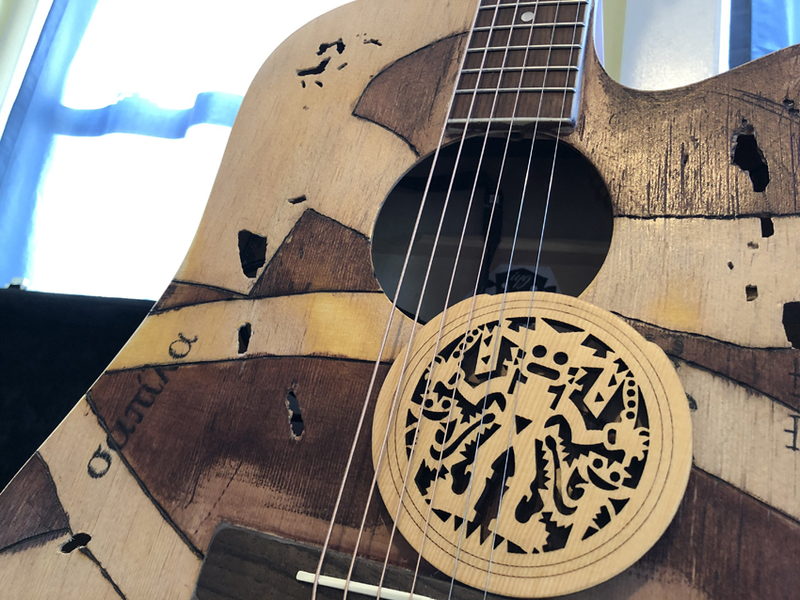 A (removable) carving of Nergal, the ancient Mesopotamian Lord of Decay, fills this guitar’s soundhole. Nergal sees all. 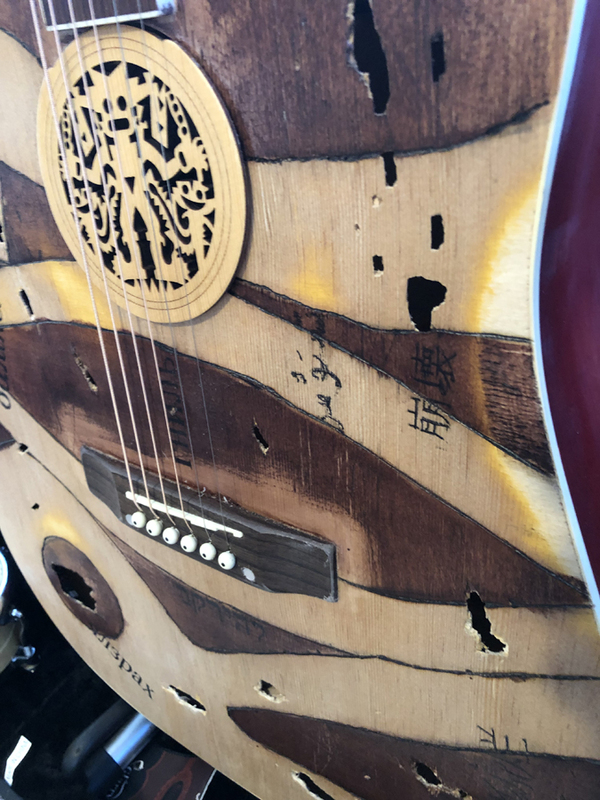 Words from many different languages appear on the face this guitar, all of which echo the theme of rot and decay. The whole world rots, You can use Google translate to figure them out. The headstock language is Zapf Dingbats. Rot is gender fluid. Men and women rot. Our thoughts and souls…rotten from the inside out. 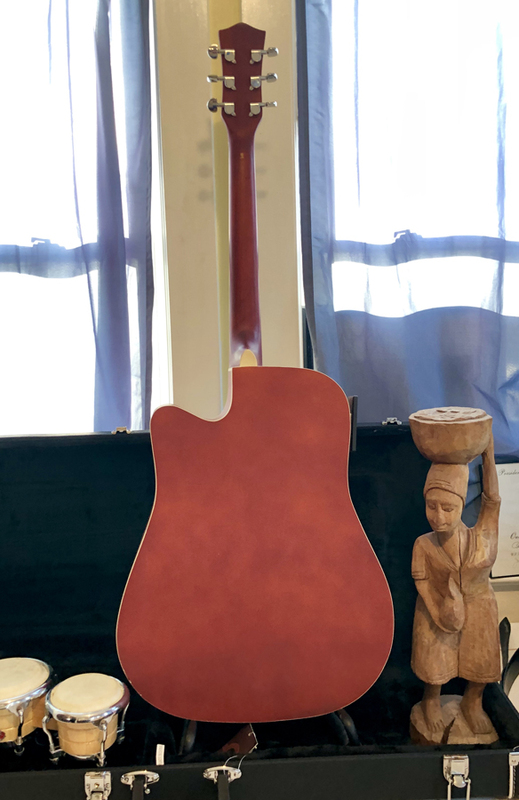 Rot is finished with a whisper-thin coat of lacquer, but I can’t promise this guitar won’t decay with age. In fact, I can assure you it will. 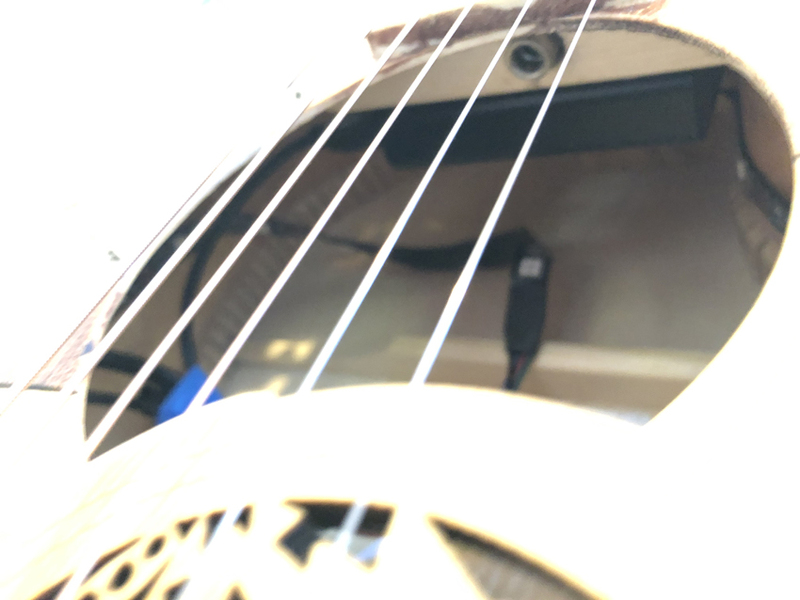 Though I finished the additional soundholes as best as possible, you’ll probably get a splinter if you poke your fingers in there. It’s meant to be rough. Rot bites. Rot leaves its mark. Rot is still an inexpensive acoustic guitar at heart, but now it has purpose.Rot is made for writing sad songs. Songs of pain, sorrow, and longing. You have these songs inside you. Rot can help get them out. 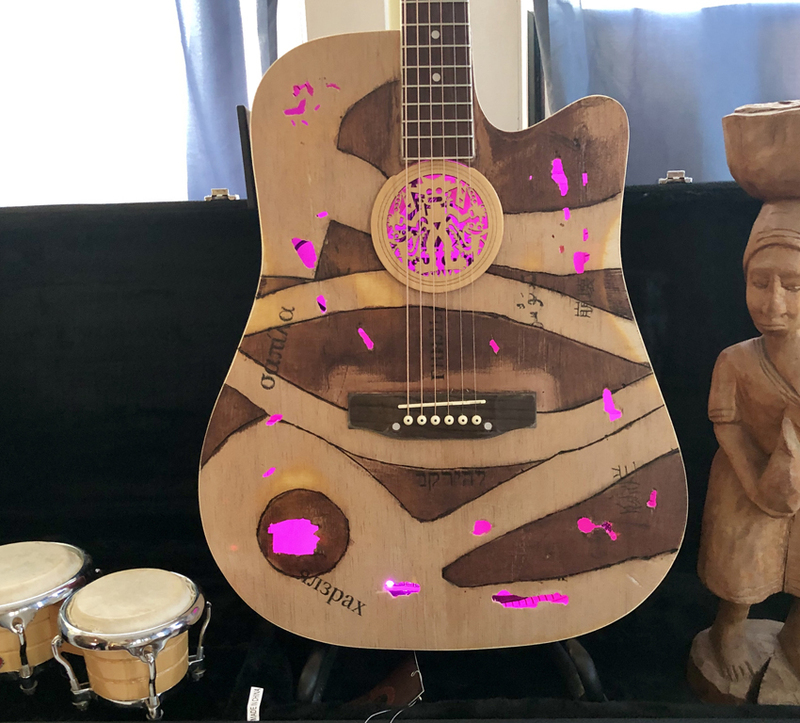 Rot is a songwriter’s guitar. It plays fine and sounds okay, but you’ll find other instruments better suited for recording and performing. Rot demands you sit, play, and write…sad songs only. There’s a hole for a strap-pin, but I won’t install it. Sit down and play. 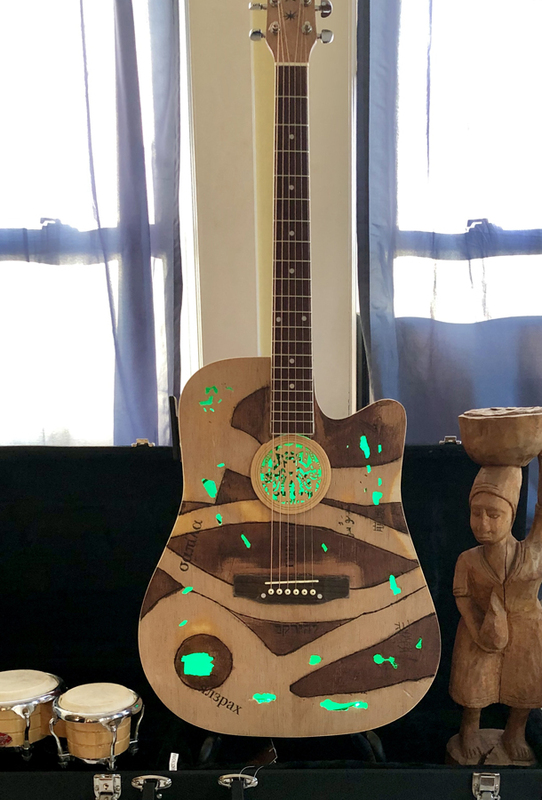 Rot is imbued with a unique inner glow courtesy of a strip of LED lights and a battery pack (four AAs, secured with Velcro inside the guitar body). Rot comes with a remote control for the lights, (mounted with Velcro on the upper bout). The effect is quite striking. Somebody is going to like the way Rot looks hanging on the wall, or sitting on a stand. Some might even call Rot a success borne of failure But to me its a monument to shame and a lack of self control. This guitar is a direct conduit to the music of the soul. I’m going to put it on Ebay and Reverb for $199. Rot was born of pain, rage, and sorrow and excels at creating music that channels those emotions. Play happy songs on Rot at your own risk. I am not proud of Rot. It reminds me of my failure as a luthier, as a father, and as a human being. I want it out of my life, though I fear Rot will never be far from my mind. A surface shaped by sorrow. 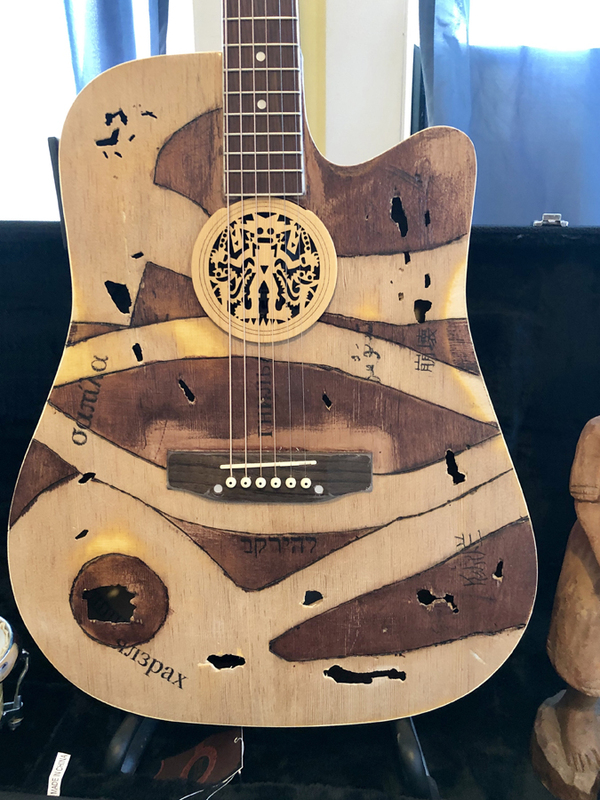 Nergal, the ancient Mesopotamian Lord of Decay, fills this guitar’s soundhole. A remote Velcroed to the upper bout controls the inner light show. The secret to Rot’s inner power…a battery pack mounted beneath the neck. We made this from rage and regret! ← Previous post:Unboxing a $67 Glarry Jazz Bass!